Fast, fresh, direct delivery with 30-days money back gurantee and 24/7 product support from #TeamAlthea..
Buy wholesale, retail, or special promo. You can get rebates as member that can be used to order products for free..
Our website is dedicated to common questions about the product. For urgent questions, go to the support page. MENTAL FOCUS: Maintain healthy cortisol & serotonin levels, increase libido/sexual desire & alertness, enhance overall sense of well-being, and help reduce physical & mental stress. LAMININE is a unique protein extract from partially incubated 9-days old hen eggs. Studies show it can help restore, rejuvenate, and repair damaged cell tissue, skin, bones, muscle, and stimulate DHEA. LifePharm OMEGA+++ support heart, bones, and eye health. Also contains Fertilized Avian Egg Extract, it delivers the best combination of omega fatty acids, COQ10, and amino acids that will keep you younger looking. DIGESTIVE+++ is a combination of a stable probiotic / prebiotic. 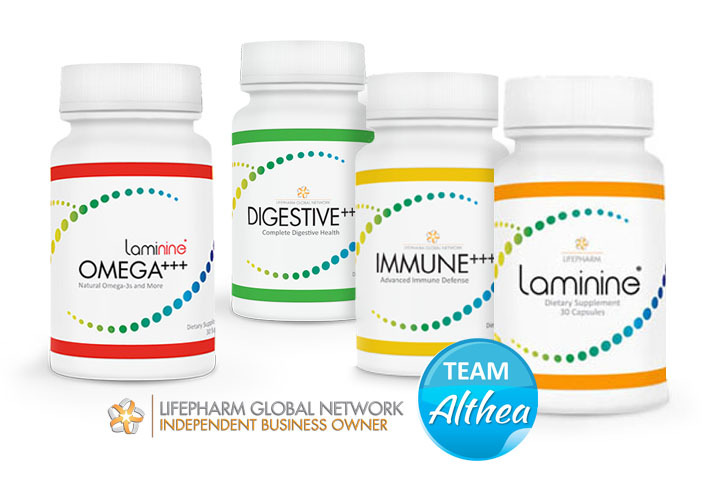 The perfect blend of enzyme that promotes healthy intestines. It aids indigestion. It encourages better absorption of the nutrient. IMMUNE+++ contains pure Vitamin C, combined with Camu-Camu, Acerola, Ashwagandha, Sea Buckthorn, and Pomegranate that help the body's immune defenses from daily stress and free radicals. Dr. Bjodne Eskeland was a foremost egg research scientist from Norway, responsible for producing the best Fertilized Avian Egg Extract. LPGN has been providing quality health products since 2012. Forward thinking, LifePharm is dedicated to your health and well-being. Authorized distributor & team leader of #TeamAlthea, working with networks in other countries to provide the best 24/7 customer support. I had back problems for 24 years. Chiropractors, yoga, acupuncture & reflexology didn’t help. After taking Laminine, I slept like never before & felt an amazing sense of calmness & improvement in my health". "I suffered form skin problems on my face, neck, chest and back. I tried many remedies but none worked. After taking it for half a year, I now have even and smooth skin on my back, face, chest. You’d never know I had issues previously". "Two years ago, I was suffering from painful stomach aches, could barely eat, slept for about three hours a night and was in constant pain. I am transformed and attribute it to Laminine". "My friends and I have experienced tremendous change in our lives since taking Laminine daily. We sleep well and feel stress-free, so we are much happier. We can focus better and have an overall sense of well being.". I was diagnosed with COPD and given one year to live. I took 4 capsules of Laminine daily & after 3 weeks, it was a miracle! My Doctors could not believe Laminine worked for me, I am still alive".